Novotel Ahmedabad is the newest entrant in the hotel scenario in Ahmedabad. With 184 rooms, it is the hotel with the largest capacity in the city. 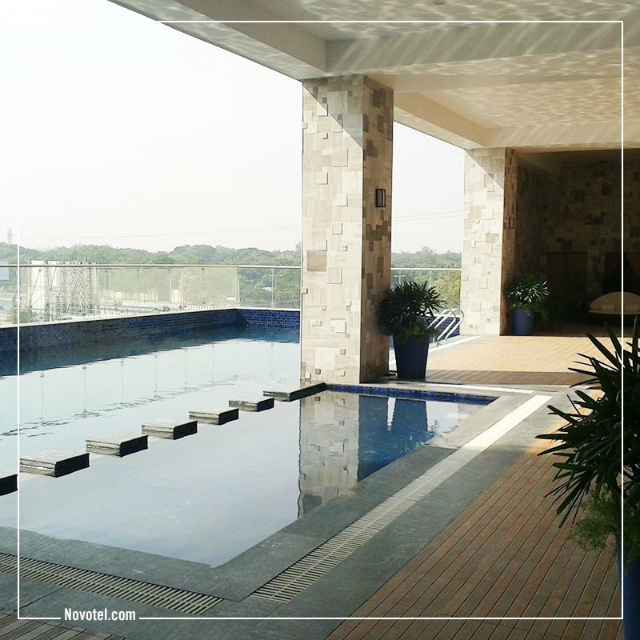 Novotel Ahmedabad is the perfect melange of elegance and comfort. Located on SG highway, this hotel has an ultra contemporary design that is bound to impress you. ‘The Square’ is their signature all day dinning restaurant wherein you can experience the aromas of Indian and International cuisine. At Novotel, you’re assured of a warm welcome and flawless service. You’ll find areas for relaxing such as the open air swimming pool and the fitness centre. With over 10000 sq. 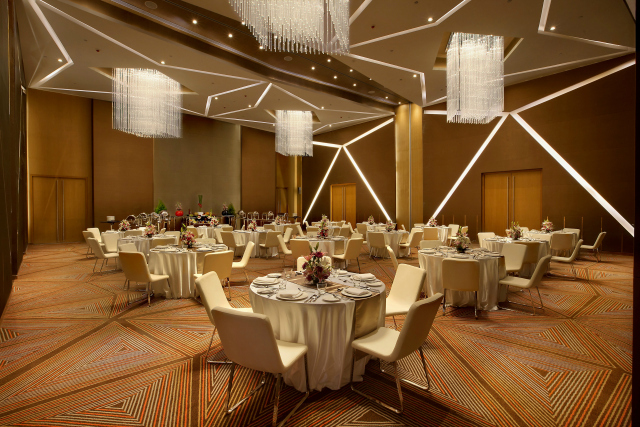 ft. meeting space Novotel Ahmedabad positions itself as an important player in the events and meetings in Ahmedabad. The 3000 sq ft. pillar free Crystal Ballroom attached with 1100 sq ft. If pre-function area is splendidly designed to give guests the luxury of space. It can further be divided into Crystal I and Crystal II for a more personalized requirement. The 4500 sq. ft. Crystal Lawns give any event a complete new feel. Be it a social gathering or a wedding celebration, the Crystal Ballroom and Lawns can accommodate up to 600 people. Rhone, Iris, Jura and Emerald – are their sophisticated conference rooms that provide state-of-the-art audio-visual technology, ensuring a productive high quality meeting experience. Whether your preferred format of seating is Theatre, Classroom, Boardroom or U-shape the Novotel Ahmedabad has a solution for you. 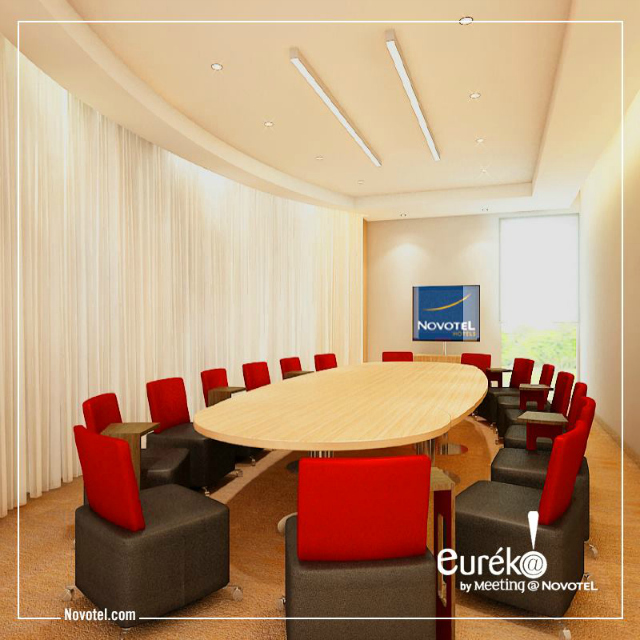 Eureka is their signature meeting room which creates a space that guarantees complete freedom in the way the meeting is conducted, from a moderated discussion to a brainstorming session where everyone takes the stage, where you can be alone or take a break, fitting every break schedule and agenda.The furniture in this meeting room is completely flexible and every piece has wheels. Thus, you can rearrange all the furniture in the meeting room easily to meet your requirements. Novotel Ahmedabad’s bright interiors will definitely catch your attention. If you are in need of a meeting place, Novotel Ahmedabad is the ideal location. 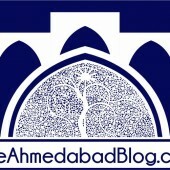 The Ahmedabad Blog team is made up of geek bloggers, professional and newbie photographers, not-so serious interns, friendly designers and a whole lotta love for Ahmedabad!